USANA, word! : Men’s Health – In Focus! Men’s Health – In Focus! We all have come to know and recognise that men have a different approach to their health and don’t often use the support systems and mechanisms available to them, compared to women. Therefore, men have a higher risk of preventable disease and death. Mortality Rate: Australian men are more likely than Australian women to get sick from serious health problems. Their mortality rate is also much higher. Overall, for every two women who die, three men die. In New Zealand in the 2000s the life expectancy of men is lower than that of women. High blood cholesterol: It is a major risk factor for coronary heart disease and possibly some types of stroke. Around 50% of men (aged 25 years and over) have high blood cholesterol. In New Zealand, until the age of 50 years, the incidence of high blood cholesterol is higher in men than in women. Coronary heart disease: Kills more Australians than any other single disease and men get coronary heart disease more commonly than women. It is one of the leading causes of death in New Zealand taking 16 lives each day, and more men die of CHD than women. High blood pressure: Around 3.7 million Australians over the age of 25 have high blood pressure and this equates to 32% of men and 27% of women. 1 in every 5 New Zealanders has high blood pressure. 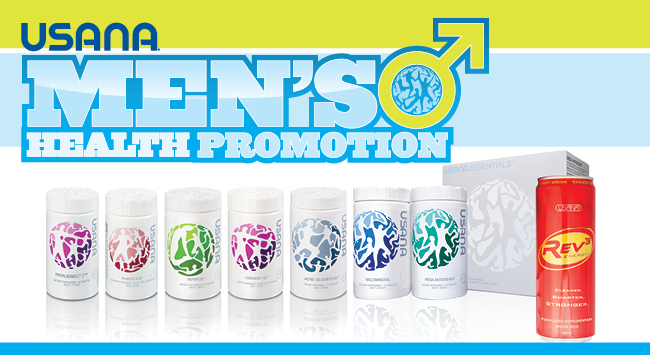 In light of the alarming statistics on Men’s Health concerns, USANA is focussing on Men’s Health in this month of November! The most important and undeniable truth regarding health is “Prevention is better than cure”. And we would all agree that making sure our nutritional intake is optimal and regular, maintaining a good and healthy body image with the right BMI, and indulging in daily exercise, sport or maintaining a good level of activity, could steer us on our way to a happy healthy living. Some of the initiatives that you can benefit from this month are: the Product of the Month for November – Palmetto PlusTM and the Men’s Vitality Pack Special. EssentialsTM with Mega Antioxidant and MultiMineral offers comprehensive and balanced nutritional support. Proflavanol® C100 with grape seed extract and vitamin C for superior antioxidant protection, heart health and skin health. Active Calcium PlusTM with calcium, magnesium and vitamin K support healthy bones, teeth, muscles and blood pressure. Fortified with vitamin D.
HepaPlusTM with milk-thistle extract, silymarin, green-tea extract, choline and alpha-lipoic acid, supports healthy liver function and normal detoxification processes of the body. Palmetto PlusTM is a combination of saw palmetto plus lycopene and soy isoflavones to support the entire male physiology in maintaining overall health over the natural ageing years. CoQuinone 100TM with CoQ10 supports healthy cardiovascular function, facilitates energy production, and helps reduce oxidative stress. Rev3 EnergyTM Drink is USANA’s natural energy drink, packed with natural ingredients such as L-Carnitine, CoQ10 and B vitamin complex which are key to energy production, and also contains magnesium which is vital to a number of metabolic processes in the body. BiOmegaTM is USANA’s omega-3 supplement which supports overall well-being with special benefits that include joint health, cardiovascular health, brain and eye health, and even supports prostate health. USANA’s Vitamin D offers a high 1000 IU per tablet strength, and is formulated to help maintain healthy bones, to support immune function and maintain muscle strength. Procosamine® is USANA’s joint formulation with glucosamine hydrochloride and Meriva curcumin to support healthy joints and cartilage. It assists in managing arthritis and osteoarthritis*. USANA Probiotic is a digestive health formula that helps maintain healthy gut flora in the intestines. While I can continue to suggest more USANA supplements, it is important for you to figure out the nutritional regime that will work best for you, taking into account your diet and current health status. You could even seek the advice of your nutritionist or health care professional to find out what supplements will work best for you. A vital combination of nutritional products, suitable for every bloke….every day! This pack contains: EssentialsTM, Proflavanol® C100, Active Calcium PlusTM, HepaPlusTM, Palmetto PlusTM, CoQuinone 100TM and Rev3 EnergyTM Drink. This special is available from 29th October to 16th November, while stocks last. So get in quick! Visit USANAtoday.com for more details on this special. Try out a nutritional regime for yourself and take this opportunity to introduce a robust nutritional regime to your blokey-bloke friends as well. It will be one big leap in the direction to long term good health! *If symptoms persist see your healthcare practitioner.